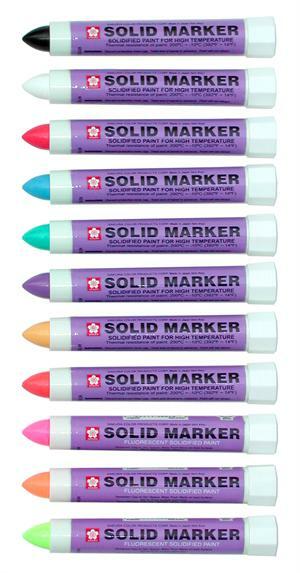 For big tough jobs, choose the popular Solid Marker. It marks through oil, grease, rust, mud, snow - inside or outside. It is absolutely permanent. Solid markers won't fade or wash off like chalk. The special "stay fresh" twist top keeps paint fresh and ready to use. Marks on auto parts, windows, steel, rubber, cloth, plastic, cardboard, wood, glass, concrete, stencil, craft projects, most anything.